﻿ Deer Creek State Park Campground - Ohio. Find It Here. 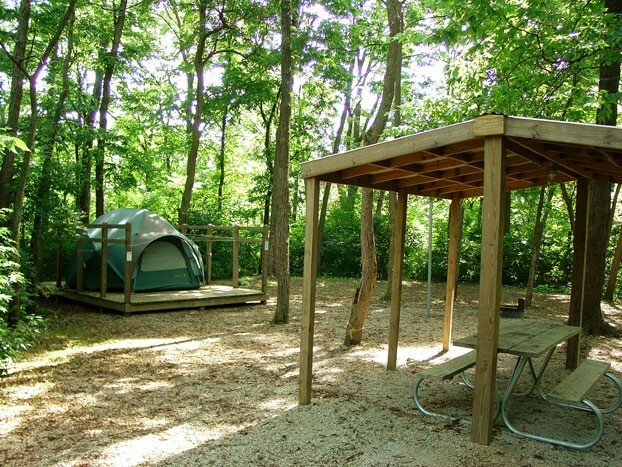 Located in the heart of Ohio's agricultural country of Pickaway and Fayette counties, Deer Creek State Park is central Ohio's vacation showplace. A collage of meadows and woodlands surround a scenic reservoir. 232 electric sites, showers, flush toilets, dump station, pets allowed, ball courts, playgrounds, mini golf, bike rentals in campground. Group camps and equestrian camp offer primitive camping. This 2,337-acre park boasts a lodge and full-service restaurant, golf course, nature center, and swimming beach. Boating, fishing, hunting, hiking, disc golf, and horseback riding are popular activities. Eight hiking trails, 17 miles of bridle trails. Seasonal programming with a naturalist at the nature center. The reservoir is 1200 acres and offers unlimited boating. A marina has fuel, boat rentals, and seasonal dock leases. Designated boat-swim areas. Excellent catfish, largemouth bass, and crappie fishing, and the lake is famous for its early spring saugeye fishing below the dam. Electric. Showers, flush toilets, dump station, pet friendly, playgrounds, mini-golf, golf course.